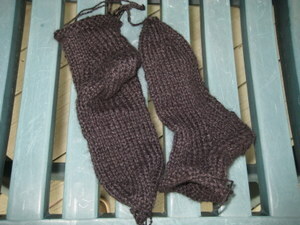 Here are socks knit since the original posting: the linen socks that got very worn got mended and worn again. But in July I bought some more linen and started another pair - on the green needles. I will be able to wear them over knee socks in the cool months. The bulky pair of amber are pure wool; the lightweight pair of amber are from a cone of rayon, a fibre archeology find at a church sale, likely from someone's stash in the Seventies. The steel oatmeal socks are acrylic - pilling a bit, as acrylic can do, but nicely serviceable. This is a re-post from several years ago but it gives examples of Woodsman Socks, their history, and the pattern. The latest pair were in linen and were lovely but they did not wear well. I likely did not throw them out (or bury them, honourably, in the garden as I have with knitting projects in the past) so I imagine they are around here somewhere but I could not find them for a photo. The 'recipe' for this sock was handed down to me by Keith Somers, a tree nurseryman in Tillsonburg, Ontario. His mother had given it to him when she showed him how to knit when he was a boy. He has made hundreds of socks over many years. 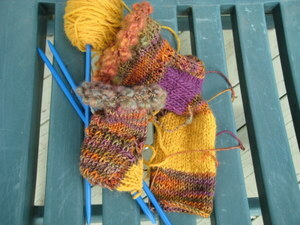 I have made dozens of socks from that same pattern: it is very versatile. 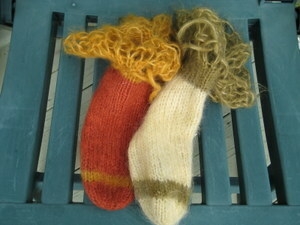 It is worked on only 28 stitches and you can vary the density of the sock with the wool (or combination of) you choose. Sadly I do not have a picture of a pair that Keith has made - either ones made from fluffy yarn like Diana which was his fibre of choice "cosy and colourful" he told me, when I first met him and which I immediately noticed peeking over the tops of his work boots or the more rugged ones he made later and would line up along the back of his sofa; when he made more than he could use - he sold the extra. The socks above are mostly a Norwegian wool - I loved the softness and the brightness; the red eyelash and blue chenille picked up the specks. They have served me for a number of years now. It suits me to wear socks over knee socks in Victoria's cool weather either with sandals or casual shoes. These socks, intentionally mismatched (I did not run out of wool!) 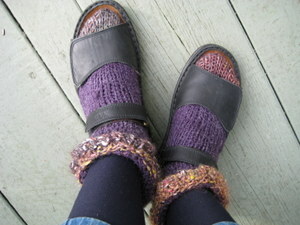 are for cold dry weather when I need the extra warmth but still want the comfort of sandals or loose shoes. The cuffs were added at the end - I think I crocheted them with a very large hook and large stitches. These are the alpaca and wool/acrylic yarn (one strand of each) I started ages ago and only recently finished; actually, they still need to have a cuff added to them - or maybe not - and the toes sewn, ends woven in. The marriage of those two yarns resulted in a compatible couple, quite lovely to work with and promising to continue nicely twined with the alpaca giving warmth and the sock yarn giving strength. It's not often that I actually go to a yarn store and buy wool for a project - usually I just go to my stash and something 'suggests' - but when I made this pair last year I wanted something to match the Noro and there was nothing purple 'at home'. It is great fun to browse a store lined with shelves and shelves and shelves of wool. This purple is - oh heck, can't remember and too lazy at the moment to go and hunt up the yarn band*. It was a worthwhile acquisition whatever it is! These are the latest socks, almost finished, a combination of koigu, handspun (not by me - I only know how to spin on a drop spindle and my output so far is about two yards of yarn), acrylic, wool. 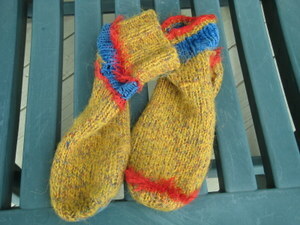 Each sock takes one 50 gr ball of wool, single strand in double knitting, double strand in 4 ply. or a mixture of yarn to come up with what suits you. #4 Can (9 US) set of four dbl pointed needles. Finger cast on 28 sts on a #4 (Can) dbl pointed needle. 1st row K2 P2 across. Taking care to not twist the first row, using fourth needle, join stitches and begin to work in the round: K2 P2 ribbing for cuff (2" for crew style, 4" for short cuff, 6" for tall cuff etc.) Or make the cuff in garter stitch if you are using really textured wool . Or leave the cuff for now and start right into the body of the sock - you might decide to knit - or crochet - the cuff at the end. The sock is meant to be fun and inspire whimsy. That is what comes to my mind at the memory of seeing Keith on his tree farm with his serious work boots and the pastel socks pouring out the top of his boots; made me grin then; makes me smile now. On the 14 sts K1 Slip 1 across and then purl back. Do this for 2 1/2 inches ending with a knit row. With spare (fourth) needle pick up 9 sts knitwise along edge following from the last row. With spare needle knit across these 14 sts. With spare needle pick up 9 sts along next edge. Onto this same (9sts) needle knit the next 4 sts from the 8 sts needle (13 sts). Slip the remaining 4 sts. onto the needle holding the 9 sts. (13 sts.) Think of this now as a triangle with 13 sts. on each side and 14 sts. along the bottom. Knit across the 14 sts. You are now at the top again. Decrease in this manner until there are 7sts. 14 sts. 7 sts.